Home > Football, NFL	> The NFL and Los Angeles, a never ending story? The NFL and Los Angeles, a never ending story? Ever since the Raiders and the Rams left Los Angeles in 1994, a host of teams have been linked with moves to the second biggest media market in America. The NFL would no doubt welcome a move to Los Angeles with the potential financial benefits a team would bring and a team in Los Angeles would be nothing new with the city having a long and eventful history within the NFL. In 1946, the Cleveland Rams moved to Los Angeles to play in the Los Angeles Memorial Coliseum. Remaining in the Coliseum until 1979, the Rams became a successful franchise however they struggled to sell out the Coliseum causing blackouts on local TV and when they were unable to build a new stadium with Los Angeles they moved down to Anaheim in Orange County. for in Los Angeles and in 1994 he agreed to a new stadium offer in Oakland and moved the Raiders back to their former home. 1994 also saw the Rams move away from Los Angeles with the team languishing behind other NFL teams in revenue and stadium developments such as luxury boxes. Luxury boxes generate huge income and both the Rams and Raiders stadiums were lacking behind a lot of other venues in the NFL. With Rams owner Georgia Frontiere talking with prospective cities such as St Louis and Baltimore, Rams fans voiced their concerns. Combined with poor performances on the field attendances continued to drop off and the Rams were eventually relocated to St Louis. Despite the undoubted market in Los Angeles, both teams did move on and ever since the city has been mentioned as a potential new home for a number of franchises. Almost instantly after the departure of the Rams and the Raiders, franchises such as the Cleveland Browns were rumoured to be moving in to take their place. However, the Browns moved to Baltimore to become the Ravens in 1996 with a new Browns team returning in Cleveland in 1999. The Los Angeles factor has since been used as a bargaining tactic by franchises that need stadium developments approved by their cities or want to generate more supporter interest. For example, in 2004 the Indianapolis Colts owner Jim Irsay visited the Southern California area with rumours surrounding the team’s relocation to Los Angeles. Although these rumours remained simply as rumours, the Colts reached a deal for a new stadium in Indianapolis. Since teams being linked with Los Angeles is nothing new in the NFL, is this year any different? So far this season teams such as the San Diego Chargers, Minnesota Vikings, Jacksonville Jaguars, Buffalo Bills and St Louis Rams have all been rumoured as potential Los Angeles franchises. Are any of these rumours at all realistic? Attendance issues have been a major factor for the Jaguars in an NFL market that appears to dwindle. 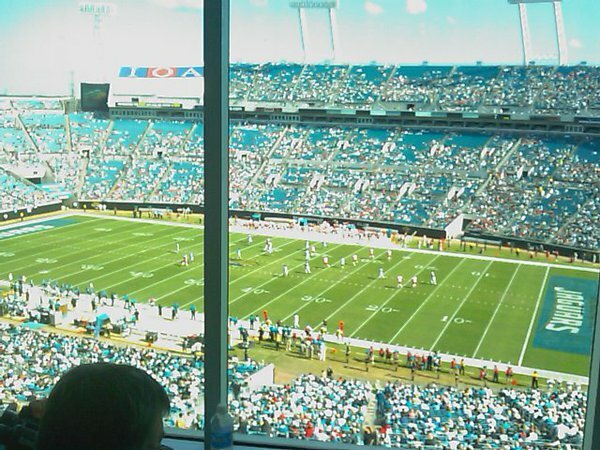 Jacksonville have had a number of games blacked out over the years with the team failing to sell out the stadium and since 2005 vast areas of the stadium have been covered over with tarp to lower the official capacity and reduce the blackouts. With one of the smallest markets in the NFL combined with the Jaguars being near the bottom of the league in attendances, season ticket sales and merchandise sales in recent years and seeing as the major driving force in the NFL is money you could suggest that the Jaguars would definitely benefit from relocation to Los Angeles. Another thing to consider is that the Jaguars have only been established since 1995 so it’s not like they have particularly strong historical links with the city that would make it harder to move the team. The Jaguars have been the most talked about team that could be relocated yet in the summer, Commissioner Roger Goodell visited Jacksonville and stated “The NFL wants to be part of the future of this city” and Jaguars owner Wayne Weaver is eager to keep the Jaguars in Florida. It seems that the Jaguars will remain in Jacksonville for the foreseeable future but whilst they still struggle to sell the team to the locals and fail to sell out their home games they will always be included within discussions about relocation, be it to Los Angeles or anywhere else. Similarly to Jacksonville, Buffalo is one of the smallest markets in the NFL. However, unlike the Jaguars in Jacksonville, the local community is passionate about their football team. With the team playing in Buffalo since 1960, the Bills have developed generations of loyal fans within the Buffalo area whereas the Jaguars have struggled to do this over their short history. Of course, with the recent poor seasons from the Bills, the interest in the team has been put to the test. In 2007 and 2008 the Bills average attendance was just over 71,000, with a slight drop off in 2009 to 70,000. The 2010 season has continued to see the team fail on the field and the average attendance has slipped down to 64,000 according to ESPN. Bills owner Ralph Wilson has always remained committed to keeping the Bills in Buffalo, however with Wilson now 92 years old, questions around the Bills future in Buffalo will continue to arise. 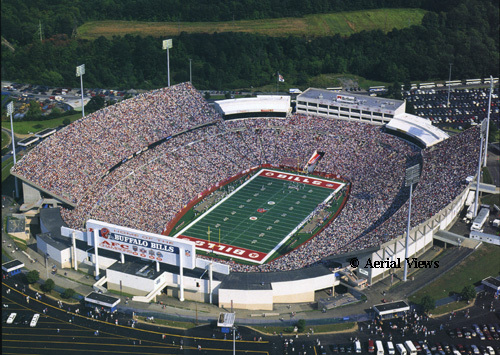 The Bills stadium is also relatively ancient, with the first game played in 1973, compared to a lot of the newer stadiums across the league and a state of the art stadium in Los Angeles would need to be taken into consideration. The Bills have moved into playing a home game once a year at the Rogers Centre in Toronto since 2008. If the Bills were to relocate in the future, Toronto would possibly be a more viable market for them to move into rather than Los Angeles. Would the Bills be a good fit in Los Angeles? Maybe not, and as long as Ralph Wilson owns the team they will probably remain in Buffalo. Like the Jaguars they will be one of the teams in the discussions about franchise movements, but with a passionate market already in Buffalo, albeit small, the Bills seem a safe bet to remain in Buffalo. The relocation of the Rams to Los Angeles seems to make a lot more sense than either the Bills or the Jaguars on the face of things. Firstly, there is the history of the Rams in Los Angeles as we’ve already looked at. Secondly, the current stadium is in need of plenty of renovation and with the stadiums lease running out in 2014, if the Rams under new owner Stan Kroenke are not offered a new stadium deal the Rams may not be long for St Louis especially if there is a new state of the stadium ready and waiting in Los Angeles. Adding to the uncertainty about the team’s home stadium, supporter attendances have continued to be near the bottom of the NFL. No doubt in large part to the team being one of the worst performing in the last decade since winning the 1999 season Super Bowl and losing it two years later. The Rams have had one winning season in the last nine and have finished bottom of the NFC West, often labelled the worst division in football, in the last four seasons. St Louis has let go of a losing team before with the St Louis Cardinals moving to Phoenix, Arizona in 1988 after a string of losing seasons and falling attendances with an outdated stadium. If issues such as the stadium cannot be resolved by the franchise and the city, the team may well be an attractive proposition for potential owners looking to relocate. With the team up for sale for a while last year, this would’ve appeared much more likely. However, with Kroenke taking full control of the team in August 2010, St Louis’ franchise seems more secure. Kroenke stated after completing the deal “I’ve never had any desire to lead the charge out of St. Louis. That’s not why we’re here. We’re here to work very hard and be successful in St. Louis” and with the team obviously improving under second year head coach Steve Spagnuolo and rookie quarterback Sam Bradford, interest in the team may start to increase around the city. The future of the franchise in the city does seem to rest on the stadium debate over the next few years. Earlier on in the year, former basketball star Magic Johnson teamed up with an investment group looking to bring a team to Los Angeles, and the Chargers were on the radar. More recent rumours around the Chargers have involved billionaire Philip Anschutz purchasing a 35% stake in the team with the intention of moving them to a new stadium he plans to build in Los Angeles. Unlike the Rams, Bills or Jaguars, the Chargers have been relatively successful although they haven’t managed a Super Bowl. The issue for the Chargers is not a losing team struggling to cope in the local sports market; it is the issue of a new stadium. For years now, fans and the local media have been desperate for new stadium, not just to provide better facilities for the team but to also make sure the team remained in San Diego. The Chargers have been threatening to bring long awaited sporting success to San Diego and they still continue to be touted as one of the most talented teams in the NFL. With only the Chargers and the Padres Major League Baseball side, San Diego has been crying out for one of their two teams to achieve success. The Padres moved out of Qualcomm Stadium in 2003 into the newly built PETCO Park whilst the Chargers still remained in the outdated stadium. 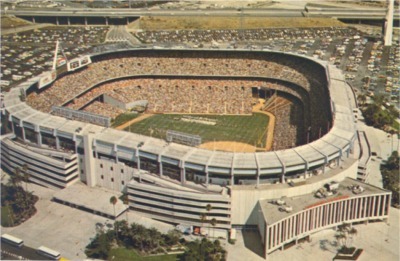 A new football stadium would not only keep the franchise in San Diego, it would also become involved in hosting Super Bowls. A warm weather location combined with a new state of the art stadium would be a perfect Super Bowl destination for the NFL. 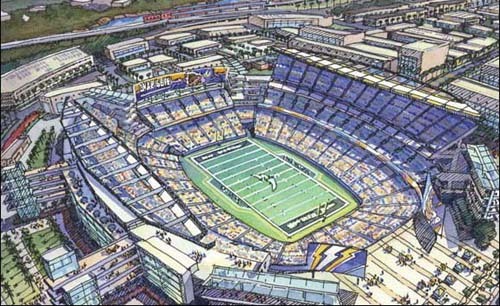 The threat of losing the Chargers has led to talk of a new stadium increasing in San Diego. If this lack of a new stadium continues on, the morelikely the Chargers are to move across to Los Angeles with prospective buyers such as Anschutz becoming involved with the franchise. They have the team, they have the fan base, and all they need is the stadium. The Vikings owner Zygi Wilf is aiming to keep the team in Minnepolis but the stadium is still only at the proposed stage still and as long as this remains up in the air, the Vikings will be linked in the same discussion as the Chargers for potential moves to Los Angeles. As long as Los Angeles remains without an NFL team, there will always be franchises linked with the city. Although these five teams have all been heavily linked with relocation, the media power of Los Angeles may well help to fuel these discussions and until anything does occur all this remains as speculation.